Capricorns are extremely determined and single-minded individuals, and they won’t stop until they get what they want- even if it means traveling through horrendous obstacles to get there. Capricorns are always seeing the reality of every situation rather than the fantasy, which gives them an edge in certain situations- especially business situations. You won’t find a Capricorn taking a moment to daydream about things that could never be- they’d much rather be determining their next move on an important subject. Capricorns tend to be a bit shy and reserved at first so they don’t rush into anything. They see relationships as a long term investment and tend to fall for someone quickly after entering a relationship. However, they prefer to stand back and assess their potential partner before making a move. That’s why Capricorn needs a real woman with a distinct personality, someone who likes the same things as they do. They don’t fall for someone with just a pretty face, which is why a Capricorn won’t typically go for eight inch stilettos and a mini skirt. Capricorn needs a lady who is as invested in the relationship as he is and is willing to go the extra mile to make it work. He doesn’t want a woman that plays games, but rather a mature woman who is seeking a lengthy relationship and is willing to work through problems. For a Capricorn, even finding a potential mate is a bit difficult. The Capricorn will sit back and watch for awhile, noting what the female likes or dislikes and analyzing her personality. He wants to make sure it’s going to be worth his time- a match made in Heaven, so to speak. That being said, the Capricorn male is not a player and doesn’t go for one night stands. He won’t fall for a girl because of the way she looks, and would much prefer to get to know a woman before even entering into a relationship.Once the Capricorn has studied his potential mate for quite sometime, he’ll be able to determine whether or not she is worth the investment. (Capricorns are always judging something on longterm- whether it’s a relationship or a business proposal). After entering into the relationship, Capricorn might seem a bit standoffish. It’s not because he isn’t interest (in fact it’s quite the opposite! ), it’s more that he does not want to show off to much of his feelings in the beginning and ruin any possibilities. Capricorn knows he’s extremely into you and doesn’t want to mess anything up, so he tries not to scare off his partner with too much romance. However, after the relationship has moved past the initial few months of dating, a different side to Capricorn is shown: his affectionate, loving side- the side where he lets you know he’d do anything to keep you in his arms. 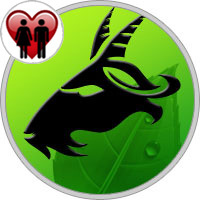 To put it plainly, Capricorn is seeking a long term relationship. Once he has found his ‘perfect girl’, he will do anything to keep her. He wants to be the man of the house and take of his lady, but also have a woman who is secure and likes the same things as him. However, Capricorn will have a problem if his woman surpasses him in any way (career wise, parent wise, etc). How to know if an Capricorn man loves you? The more successful you are the better your chances are of getting a date with the Capricorn zodiac sign. Let him choose the venue, though, for he has very specific tastes. Only the best will do, and he wants to make sure you see how wealthy he is. This means he will shower you with lavish gifts as well, but don’t worry about returning the favor. He likes being able to provide beautiful things for his companion, and he can already afford to buy nice things for himself. If you want to show your affection take him out to his favorite restaurant or score tickets to a popular show. Stick to conventional presents for he doesn’t like anything too unusual, and be prepared for many “dinner and a movie” dates. The Capricorn man doesn’t care about spicing things up because he has everything just the way he wants it. So you’ll have to okay with his lifestyle first if you want to become a part of it, for he won’t change it. He’s as stubborn as the goat that symbolizes this astrology sign, so be prepared to have to wait before he decides to let you into his life. If you too are obstinate, then you will not share a harmonious love compatibility with him. So be prepared for a break up! Although a Capricorn man may have a somewhat rough exterior and find it difficult to share his emotions, he is still rather insecure on the inside. His strong ego needs to be constantly stroked in order for him to feel as strong as he wants to be. This man is looking for someone to take care of him and for someone who will let him take care of her in return. His insecurity is one of the biggest secrets that a Capricorn man has. He may want to portray a strong image to others, but in a relationship he is just looking for someone who will be there for him. Capricorn’s dream relationship is one that allows him to be in a balanced partnership with someone just as strong as he is. As much as a Capricorn man loves being with someone, he still needs time to himself. This man is notorious for pushing his partner away; it rarely has anything to do with the woman in the relationship, but rather with Capricorn’s desire to reflect. In relationships he will often pull back so he can evaluate how he feels and where he sees the relationship going. He also has a difficult time opening up to others and will withdraw so that he can feel like he is the strongest person in the relationship. The best thing that a woman can do to keep a Capricorn man who is pulling away is to give him his space.